I slid off the swim deck, careful not to splash. Galapagos sharks circled around, slow, rhythmic. 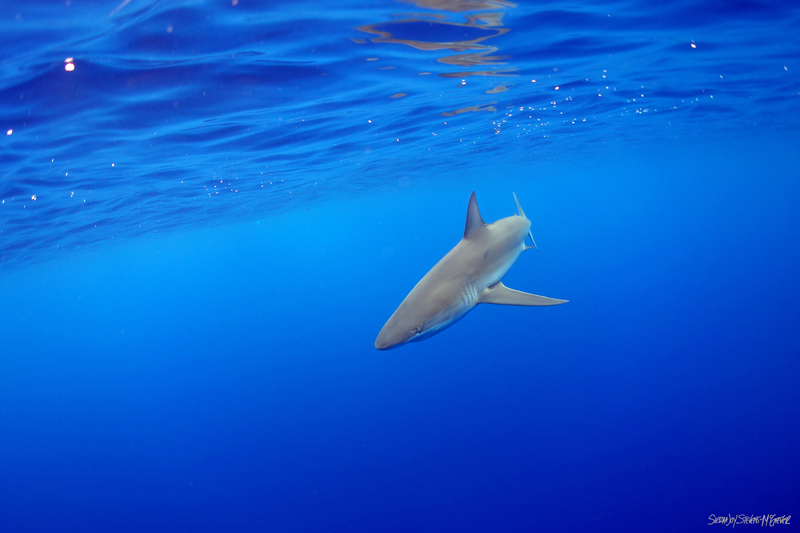 Their graceful caudal fin swung back and forth and with it the body of the shark shimmied side to side in that classic way only sharks can—methodical, the essence of grace. Their eyes looked at me each time they passed with only slight curiosity and I looked back, absorbed in the silence of the sea. Ranging from six to nine feet in length the circling sharks were but teens of their species, perhaps ten years old, in the size range that Galapagos sharks reach sexual maturity. Fully grown they can reach up to twelve feet and live into their early twenties. Though they are seen regularly off the Hawaiian Islands and are distributed in tropical waters around the globe, their population is patchy and affected by local fishing activities. The species is listed as “near threatened” by International Union for the Conservation of Nature and is data deficient in parts of its range, meaning we don’t really know how well they are doing. 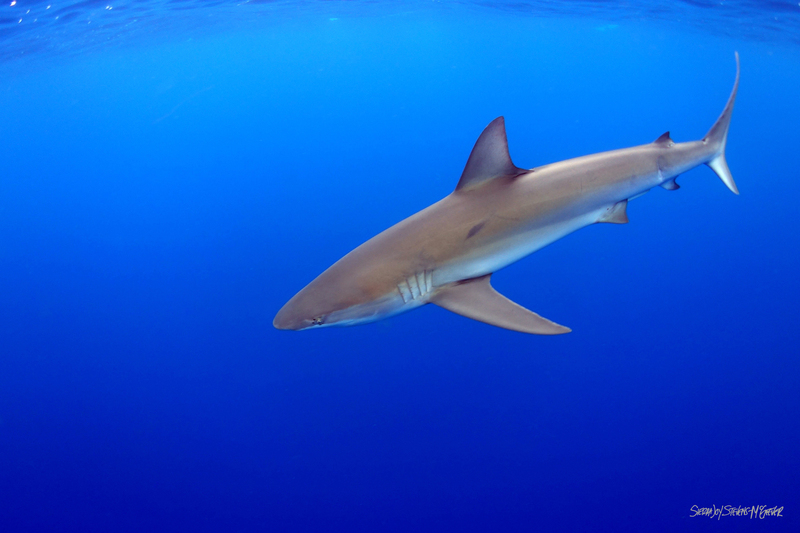 Though only one human fatality from an attack by a Galapagos shark has been recorded, their population is in decline due to human exploitation and bycatch. With low reproductive potential and thus low intrinsic rebound capability, their populations are vulnerable to extirpation, especially in more isolated locations. Over the course of the next hour the sharks moved by and beyond me until their forms were eaten up by the distance. Sometimes they passed close enough to touch, other times I could barely make out their gray outline within the cobalt world we shared. For me there was no thrill, no racing heart or nerves. Instead I experienced an encompassing feeling of peace and serenity. Humans have taken grand measures to rid our planet of predators larger than ourselves and built up around these creatures an expanse of fear that stands to justify such reckless devastation. And so there is a humbling assuredness of being with some of the last of these creatures; of looking them in the eye and knowing you are safe—as safe as in your own home, safer than in your car. These animals are not the threat we are told they are; we are the threat, to them and to ourselves. Being with them affords us a chance to reconnect with a wilder world, our place on the food chain, the need to speak for the voiceless. That day we were two species possessing mutual respect and curiosity, neither predator nor prey, just creatures of a great, blue planet. The reason I was able to feel calm in the presence of these great predators is all about behavior. I entered the water silently, made no sudden movements, never flailed, chased or harassed them, or in anyway indicated that I might be food or foe. 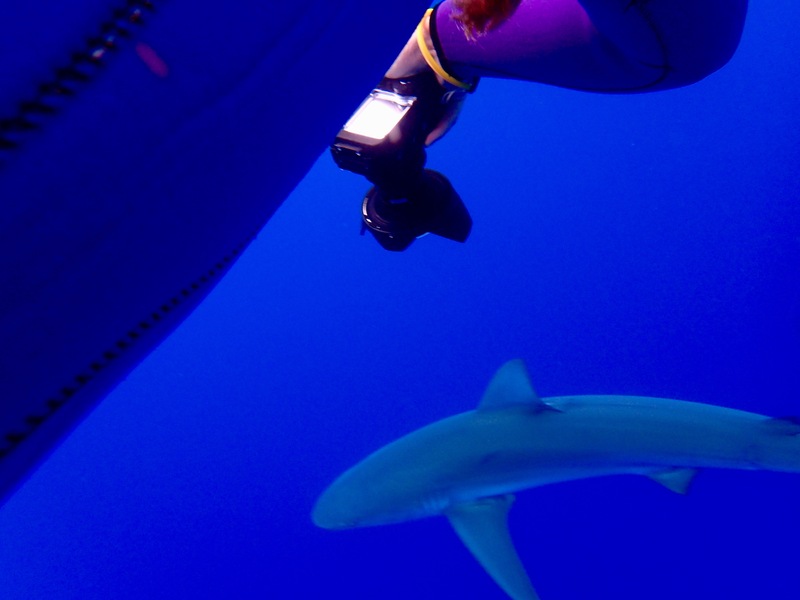 In turn, the sharks were calm and relaxed around me. Galapagos sharks perform threat displays when they are uncomfortable by arching their backs, lowering their pectoral (side) fins and swimming in a figure eight pattern, sometimes puffing their gills. If you see this behavior, calmly and quickly get out of the water. Encounters with any wild animal require respect and caution. Beautiful photos and well written. Amazing story and incredible photographs. I am so impressed!! This story is thrilling to read!